from 11.00 o'clock and Opening of the Course is at 14.00 o´clock. We would like to thank to all applications for scholarship received on time. Acknowledgment was sent to all accepted. we would like to encourage participants to present their research in the form of poster presentation. The scientific committee will evaluate all contributions and award THE BEST POSTER. Organizers decided to grant a scholarship to a total of 10 participants in the form of a FREE registration and to 10 further participants in the form of 50% discount from the registration fee. Please send your application incl. CV and a short explanation on the reasons of your request to the e-mail: peckova@cbttravel.cz before June 10, 2017. The selection will be made by the Scientific Committee and the participants will be informed by 30. 6. 2017 at the latest. 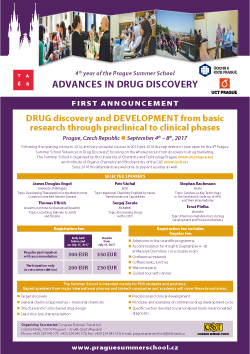 Following the opening course in 2014, and very successful courses in 2015 and 2016 the registration is now open for the 4th Prague Summer School "Advances in Drug Discovery", focusing on the whole process from discovery to drug marketing. The Summer School is organized by the University of Chemistry and Technology Prague (www.uct-prague.eu) and Institute of Organic Chemistry and Biochemistry of the CAS, (www.uochb.cz). As in 2016 the attendants are welcome to present their research in the form of poster presentation. Specific section devoted to personalized medicine and related diagnostic.